I covered these issues in the previous post. In this one I will deal with the issue of how I made jeans. I had never used denim before. I thought of it as heavy, hard work to get through the machine, very bulky to stitch. Actually it is the most stable fabric imaginable and unbelievably easy to cut out, sew and press. I really enjoyed the process with dozens of steps explained by Lauren with good diagrams. What a lot of work instructions are. But for me important and very helpful. She tells you when to change the thread, when to back-stitch etc. The process reminds me why I like commercial patterns – you can really relax your brain and just “do as you are told”. When you make your own patterns and designs you can’t lose concentration for one minute. I recently commented on Instagram, in response to “why do you sew?”, that I like the mental challenge, with Marilla Walker agreeing that the intellectual challenge is much underrated. Not if you make your own patterns. Poor Lauren really struggled to complete the pattern on time. She has sweet little babies to look after and it amazes me how she and Marilla can combine pattern designing with looking after children. I tell you one night shift with my grandchildren and I need a full day to recover, followed by an early night. So there were a few little problems with the instructions. But I found the pattern itself very well drafted and it has certainly been interesting for me. Sewing denim together is surprisingly easy. It is so stable and well-behaved. So long as you have a decent machine, good needles and thread making jeans is a piece of cake. Top stitching was very common in the 1960s, and I usually do this by hand on a woollen, couture item. For denim jeans top-stitching is part of what makes them what they are – very long-lasting, robust, outdoor, working trousers. The rivets give even more security. I hadn’t really done much machine top stitching before so this was a good exercise for me. Following the notches on my machine foot I think I managed to make the top stitching look fairly professional. The machine did struggle over some of the very thickest parts but on the whole it performed amazingly.The pattern is very good at telling you to change thread and stitch length at the right moment, every time. I did have a problem with the bar tacks. I eventually found that my machine had a bar tack setting which helped. But with the bar tacks and button-hole I found it necessary to put a regular white thread in the bobbin because the stitch was not entirely on the top of the fabric. Probably a little tension issue, but this resolved it. Readers I nearly cried about the zip. I didn’t really like Lauren’s instructions on how to do this, vastly preferring this method beautifully explained by Sandra Betzina (I love her voice). But that wasn’t a big deal; her instructions were fine and I got the zip in. A bigger problem loomed. The instructions call for 7’/18cm zip which I dutifully bought. I am quite competent with zips in general and I prefer a longer zip that I snip off at the bottom once I have completed the step. This is so I don’t have to maneuver around the zipper pull – especially important with an invisible zip I find. So the fact that the zipper was to be cut off at the top didn’t initially phase me. To cut a long story short once the jeans were fitting perfectly I moved to the waist band and because I had snipped off the upper zipper stops the pull just came away and zip was ruined. This was when I had a little sob. I had to undo perfectly lovely top stitching and reinserted a new zip (which I had to go out and buy). I was much more careful this time, having learnt my lesson. I stitched the waist-band nice and close to the top of the zip where I had cut off the teeth so they wouldn’t ruin my machine, and what happened next – yes I pulled off the second one too! This time I actually cried. As I had now broken two zips I fixed my jeans with a “zip repair” the third time. I just couldn’t face pulling out the top stitching and dismantling the jeans yet again. Also by now Lauren announced she had an improved pattern available. I decided to make a second pair and make them perfect. Yes I can make jeans. You can make jeans too. This is a good pattern, giving lots of opportunity for personalisation. DIfferent length – shorts, ankle etc. I would have cried too but hopefully all that stress was worth it because the jeans look great. Such a good fit. Very professional looking and a great fit, when do you sleep? Oh, and can I just say that I like how they break just on the instep, imo so many handmade trousers are spoiled by hemming too short, I hate half mast pants they ride up far too high when sitting or crossing the legs. You’ve got it just right. Your jeans do look professional!! That topstitching is perfect. And I would have cried, too. In fact, I had a zipper “malfunction” too, and I nearly cried. But yours turned out so nice in the end, hurrah!! Coming from you Emi – the Japanese Jean Queen – that is some accolade. I will be following your adventures with enthusiasm. I feel your pain about the zips! 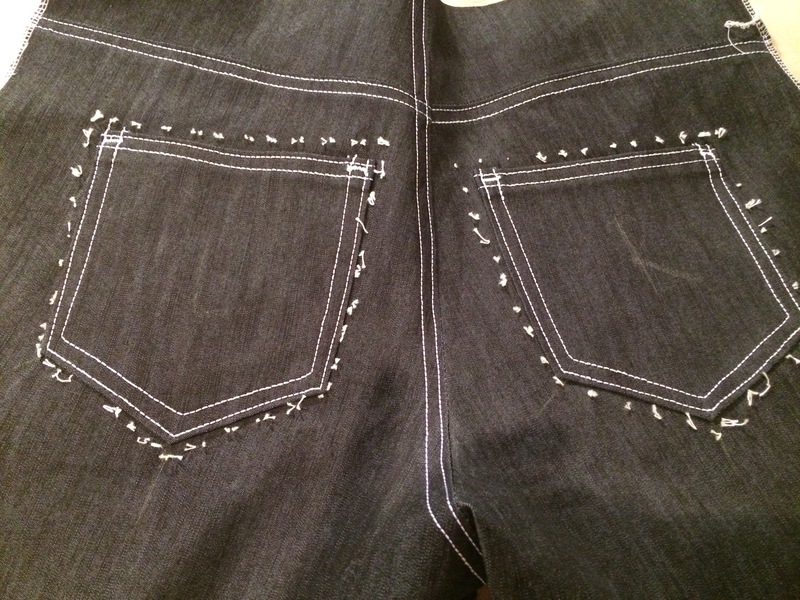 I have inserted a zip into jeans, following my class instructions – I made a pair for David; not perfect but perfectly okay. Recently I attended a workshop with Claire Tyler and she showed us the easiest (and nice too) way ever! Your end result looks good. Wonderful looking jeans. The construction can be tricky but you’ve handled it well. I would have cried too after the second zip disaster. Here’s a couple of tips for your next pair: put a safety pin across the zipper teeth on one side immediately after trimming it. 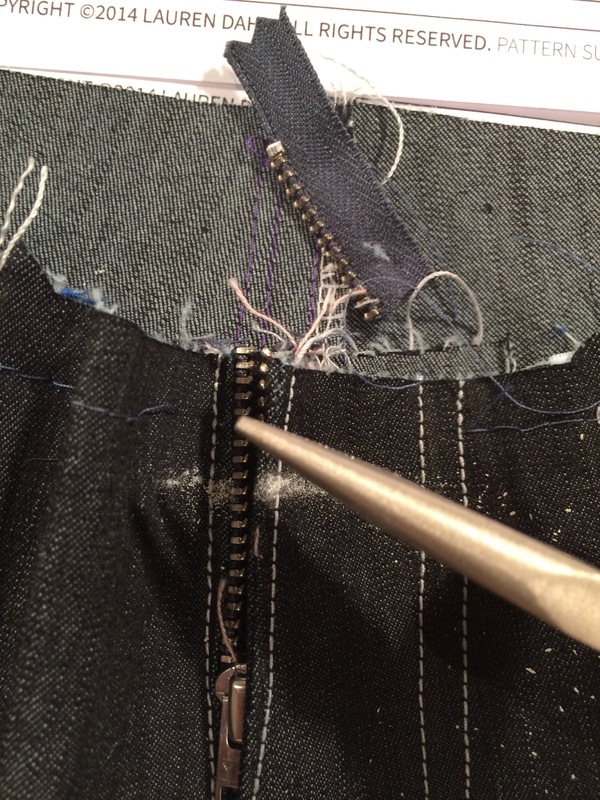 For bulky seams, pound with a hammer before sewing. The hammer flattens the fabric and softens it for easier sewing. Lauren specifies a hammer and uses it. I didn’t feel the need to, but as I have now had it on the highest authority I will try it. And the safety pin – they are such a great invention I need to get more of them in my life. Thanks as ever Mary. These look really good. I’ve never even thought about making jeans before (too scary) but your blog posts have tempted me. They look really good on you Kate. Your perseverance paid off. I would have cried too. These are great! The fit around the bottom is perfect. Well done for keeping your nerve with the zipper and getting there in the end! I’ve never made jeans (because I don’t wear them) but I feel your pain with the zip!! They look amazing on you, such a great fit. Fabulous! Your perseverance is amazing (no matter about the tears….who wouldn’t shed a few? 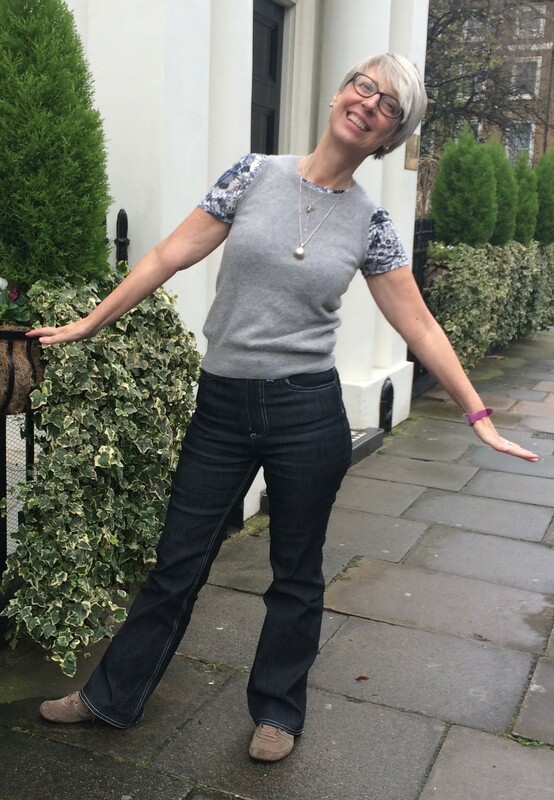 ), as are your new jeans! The tutorial is great, too, but I have a question….how did you actually sew the waistband with the zipper opening above the top of fabric? Did you make a new stop for it? Sorry, I’ve recently made my first zipper in ages and wasn’t overly pleased with it. Lining it up was a trial. Kate, great work on the jeans. The fit is excellent. Thank Gail. They are getting quite a lot of wear.